Specializing in (but not limited to) the Grateful Dead’s music from 1969 through the late 1970s, Winterland has lit a wildfire of excitement in its growing audiences of fans who flock, in droves, to every single one of their shows … and for good reason: Winterland pulls you back in time to a place where the Dead’s rhythm and blues, folk, and country roots were still deeply embedded in their music even as they explored the wild and experimental frontiers of psychedelic rock. 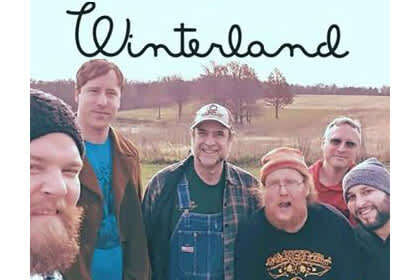 More importantly, though, Winterland channels the music of the Grateful Dead with an uncanny authenticity, a sublime fidelity to the Dead’s musicianship, sound and emotional connection with the audience – that almost indefinable something that, according to audience feedback, Dead fans are currently hard-pressed to find outside of Dead and Co. Though Winterland’s seasoned musicians individually play music ranging from jazz, bluegrass, experimental rock (like Primus and Zappa), soul, funk, old country blues and rock n roll, they all have one thing in common: an appreciation for – or, in the case of some – a passion for the music of the Grateful Dead. And all of them are thrilled by the success that their relatively young band has gained in the Midwestern region.